The Nevada Transportation Authority (NTA) handles the administration and enforcement of state laws in regard to passenger transportation, tow cars, and household goods movers/storage. It also oversees the Nevada Taxicab Authority, which handles all aspects of the state’s taxicab industry (except for Clark County). If you are or would like to become a Nevada limousine driver, taxi cab driver, or other type of driver that falls under the NTA umbrella, you will need to undergo a fingerprint background check as a part of the application or renewal process. Fingerprinting Express helps drivers complete the Nevada Transportation Authority fingerprinting requirements so they can get to work more quickly. Please note that you must complete the initial application and turn into the NTA to receive your Livescan fingerprint form to get fingerprinted. For details on the process of getting a driver permit through the Nevada Taxicab Authority, click here. Other drivers and carriers, find information regarding your specific requirements by going to the Nevada Transportation Authority website. Fingerprinting Express can help you get on the road faster. We are an approved fingerprint vendor for all Nevada boards and divisions. 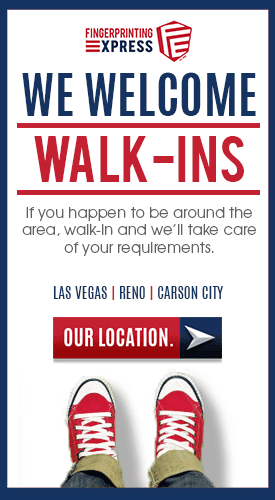 We have four clean, modern facilities in Carson City, Reno, and Las Vegas where you can have your Livescan or hard copy NTA fingerprints taken. We can also make copies of your driver’s license and take the passport photo for your application if it is required. If you have any questions about the fingerprinting process, feel free to give us a call at 800-919-0227.